Television show pitch: A police procedural about a tiny, 3 inch tall (you might even call him "petite") French-Canadian detective named Mort. He uses his diminutive size to spy on unsuspecting criminals and has an amazing success rate. His partner is a talking Chihuahua named Nacho who is only slightly taller than Mort and in the pilot episode, he's only three days away from retirement. Of course, that means that... Woops, as I was typing this, the NSA was analyzing it on behalf of CBS, who has just offered to buy the rights for the "La Petite Mort" show for $3 million. Those guys sure love their police procedurals. So you're going to have to wait and see what happens to Nacho in the pilot episode. 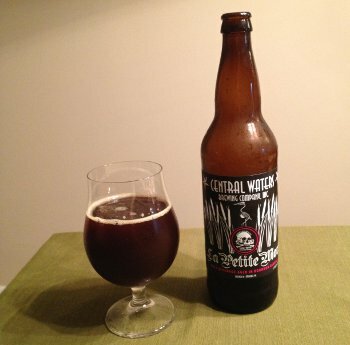 Central Waters Local Option Bourbon Barrel Aged La Petite Mort - Pours a deep, dark brown color with a finger of off white had. Not getting a lot out of the nose. Hints of bready yeast, fruit, and bourbon. As it warms, the nose opens up a bit. Taste has lots of caramelized sugars, maybe even some bready toastiness, an almost nutty flavor too, hints of fruit, with that bourbon and oak coming through towards the finish. 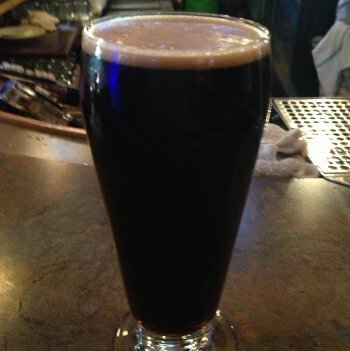 Mouthfeeel is well carbonated, medium to full bodied, but only a hint of richness from the bourbon barrel. Relatively dry, which doesn't usually work well with bourbon, but the balance is on point here, so nothing is overpowering. Overall, this is good, really good, and a really nice change of pace too. It grew on my as I drank, too, which is always nice. Solid B+ material. Beer Nerd Details: 9.05% ABV bottled (22 oz. bomber). Drank out of a tulip glass on 6/7/13. Vintage 2013. Central Waters is a brewery I should probably check out more often. Nothing in the immediate pipeline, but their stuff seems available enough around here that I'll certainly pick some up at some point. 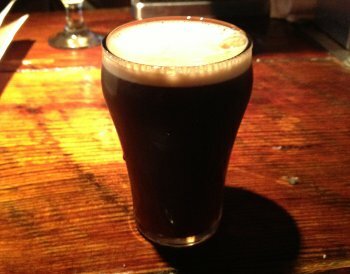 The Lost Abbey: Inspired Beer for Sinners and Saints Alike... and also for: the Antichrist! Tomme Arthur's middle name? Damien! Does he have the number of the beast birthmark? Of course he does! Number of days since the last freak accident at the brewery? Two. Somehow a lose pane of glass was launched horizontally through the brewery, hitting a mild mannered bottling line worker right in the neck, popping his head off like a cork (well, a cork in a well carbonated beer, so, like, not a Lost Abbey cork). The disembodied head tumbled through the air, carromed off a couple of bottles of Cable Car and landed directly in the trash can. The tragedy was mostly averted, though, because the bottles of Cable Car were unharmed. I will say, this was a bit pricey. I generally expect that from Lost Abbey, but I've heard it can be found for sub-$10 in some places, which would be a bargain. Not sure if it was just a bottle shop markup or what... Legit beer though, especially if you like those Bretty saisons/pales. 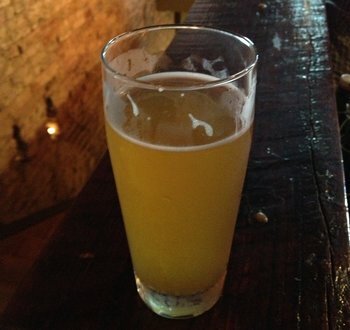 Now that it's officially ended, I think it's fair to say that I failed at Philly Beer Week. I went to a few things, but it seemed that all of the week's most interesting events were happening at inconvenient times for me (not complaining here, as it's a total pain to get into the city and I don't do it often enough). To be sure, I went to a few events and sampled a few beers, but nothing like last year's Hill Farmstead adventure, though I suppose the two Tired Hands events warrant excitement (technically not part of the official proceedings, I'm going to say they count anyway). 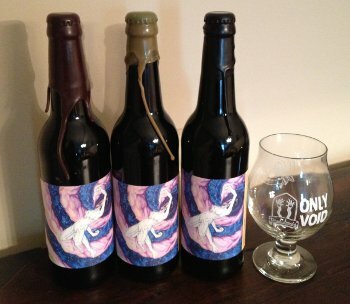 You've already heard about their anniversary event, but they had an Only Void bottle release yesterday too, and I was fortunately able to get there early enough to snag some fancy glassware and bottles (sub-250 bottle release for each variant detailed below). The black waxed one is straight up Only Void aged in stainless steel, which I got to sample at the Anniversary last week (it's spectacular). The light greenish waxed one in the middle is local rye whiskey barrel aged Only Void (I'll have to confirm this the next time I'm at Tired Hands, but I'm guessing that "local rye whiskey" is Dad's Hat Rye, which is a distillery I've been meaning to check out). I'm particularly excited for that one since, to my knowledge, it's the only non-sour whiskey barrel aged beer Tired Hands has ever made... 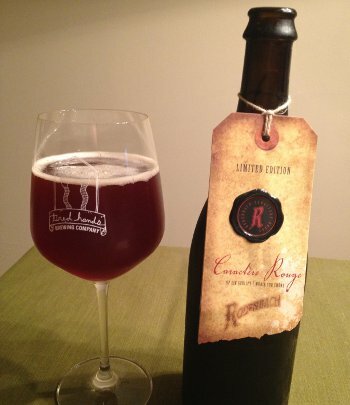 Finally, we've got the red waxed variant, which was actually barrel fermented and then aged in local red wine barrels. They had some of this on tap at the release and I managed to snag a sample before it kicked (which happened within the first hour - there were still people waiting in line for bottles). Very nice fruity sour notes to this one. Special thanks to Rich on Beer for gifting his seat at the bar to me when he was leaving, much appreciated. Beer Nerd Details: 8.5% ABV bottled (22 oz waxed bomber). Drank out of a snifter on 5/31/13. White Wax version. There's supposedly a variation of this beer packaged with black wax that had a lot more chocolate and was even better, which sounds pretty awesome (but also apparently quite limited). 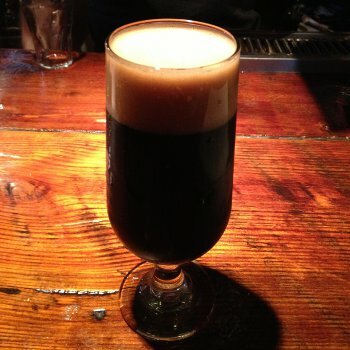 This beer is no slouch, so I'd keep an eye out for both if you're the type who likes their stouts chocolaty. Made in pretty much the same fashion as the Kriek, but with raspberries instead of cherries. Named Rosé because of the color, but dedicated to Gambrinus instead of Bacchus. Gambrinus is a legendary king of Flanders, and an unofficial patron saint of brewing (the official honor belongs to Saint Arnold). He's also apparently getting a lapdance on the label of this beer. Good for him. Beer Nerd Details: 5% ABV bottled (375 ml capped and corked). 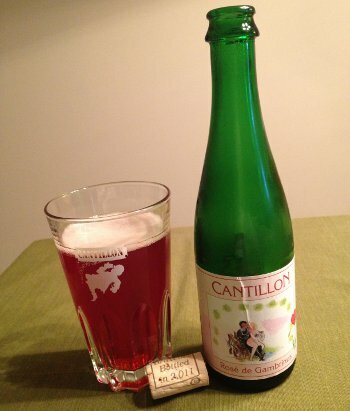 Drank out of a Cantillon Gueuze tumbler on 5/31/13. Bottled 12 October 2011. And the hits from Cantillon just keep coming. A couple more in the pipeline, too. Very exciting. I think I may have missed my calling. For the sake of posterity, some half-remembered notes are recorded below. You're welcome. The Captain's Invisible Moon - Which, if named after the style, would be "The Captain's Cream Ale", which just sounds gross. Unless you're a big Chris Evans fan. Like, a really big fan. Oh yeah, the beer. A homebrewed cream ale, it came out pretty well, kinda like a wheat beer, but with that smooth texture of a cream ale. Really easy drinking and a good way to start the night. Lagunitas Undercover Investigation Shut-Down Ale - I have actually had this before (and incorporated it into my Choose Your Own Adventure Beer Review epic), and in this setting, it stood out pretty darn well. I could probably be tempted to upgrade the rating, but I'll leave it at a B for now. Oude Gueuze Tilquin à l'Ancienne - This is the green bottle in the artist's rendering above! One of my other contributions of the night, this one is every bit as good as I remember, and compares favorable with the big boys at Cantillon and 3F (at least, when it comes to their regular lineup). Still an A- in my book. Well, there you have it. We'll return to normal review blogging for the next few days. It is actually Philly Beer Week, so I should probably hit up some other places this weekend and write about a few things I've already seen. Or something. I'll be the first to admit that my palate isn't the most refined of them all, but one of the things I appear to have absolutely no tolerance for is Diacetyl. 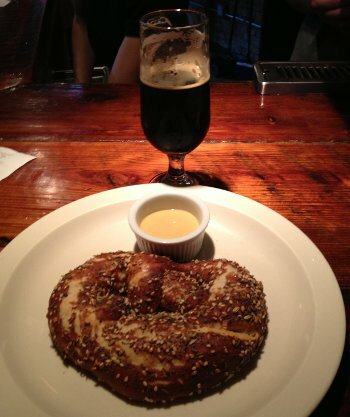 It's a byproduct of fermentation that can yield powerful flavors of butter or butterscotch to a finished beer. I know what you're thinking: Butter and Butterscotch are awesome! And yes, it is, but you wouldn't put a pat of butter in your beer, would you? That's kinda gross, is it not? Well, to me it is, but to some, low levels of diacetyl are actually desirable (high levels, not so much). Notably, a lot of English pale ales tend to lean in that direction. Not all of them are like that, of course, but that just makes sampling British beers a bit of a crapshoot for me. In this case, an expensive crapshoot, as I (wrongly) assumed that a port cask aged barleywine would have minimal diacetyl. Beer Nerd Details: 11.5% ABV bottled (adorable little 9.3 oz bottle). Drank out of a snifter on 6/1/13. 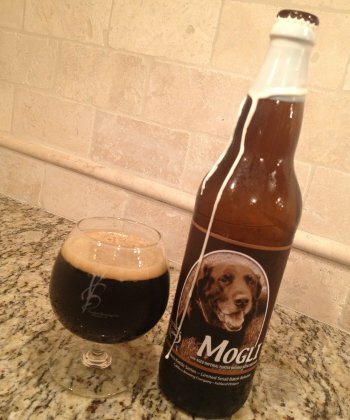 Brewed in 2011. A pity, as I like a good Porto every now and again and you rarely see US beers aged in Port barrels. Yeah, so anyway, I'm probably not going to check out the various other barrel aged treatments of this stuff, especially given the expense (for a tiny bottle, no less). Fortunately, I had some other great beer this weekend that would make up for this one, so stay tuned. Well, what have we here? 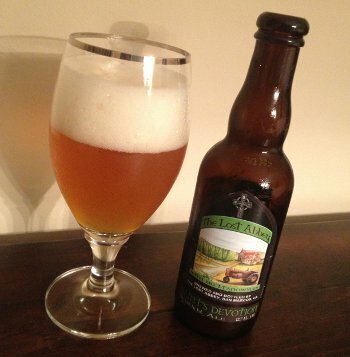 Yep, it's a saison, complete with baffling inclusions like trendy Galaxy hops and dark malts, brewed with Brett. Plus, it's got a label featuring constellations in the form of... the Harlem Globe Trotters? Also depicted: two disembodied blue hands pointing towards a galactic core consisting of a giant hot dog. And when I say "giant", well, if this is drawn to scale, let's call it about 1,000 light years long (and a diameter of about 200 light years). That's a big hot dog. Fortunately, no hot dogs were used in the making of this beer. 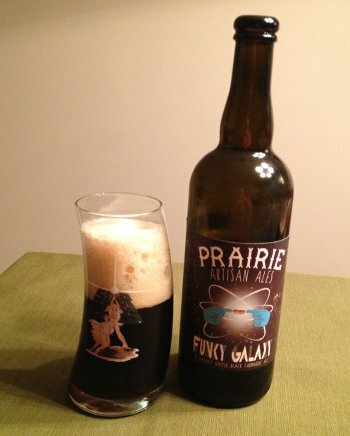 Unfortunately, I'm not sure all the disparate components came together as well as Prairie hoped. Beer Nerd Details: 8% ABV bottled (750 ml caged and corked). Drank out of whatever you call that Star Wars glass on 5/26/13. Man, this lack of harmony seems to be the theme of last weekend, but fret not, for tomorrow we'll be talking about a spectacular beer that has harmony out the ying yang. Or something. Stay tuned.